Beach season is almost year round in Galveston and they’ve got a great one in East Beach, featuring a boardwalk, live music, and concessions. Relax at Moody Gardens, with 242 acres of botanical gardens, or take a trip back in time at the Lone Star Flight Museum, featuring vintage warplanes of a bygone era. If museums are your thing, there’s also the Ocean Star Oil Rig Museum, the only one of its kind. 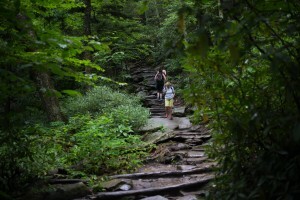 The trek up Rough Ridge Trail, in the shadow of Grandfather Mountain off the Blue Ridge Parkway, offers lush forests and a stunning view at the top. Banner Elk wows in any season. Scramble up craggy rock paths at Grandfather Mountain, atop one of the highest peaks in the scenic Blue Ridge Mountains. Test your meddle on the Mile High Swinging Bridge, the highest suspension foot bridge in the country. Families can check out Tweetsie Railroad, with two vintage steam locomotives, or ski Sugar Mountain resort in the winter, which also has a new snow tube area for the little ones. This barrier island is characterized by four fantastic public beaches, lighthouses, and nature trails. Visit Fort Macon State Park, a Civil War relic that also offers visitors beach access. The N.C. Aquarium at Pine Knoll Shores has stingray touch tanks, river otters, sharks, and thousands of aquatic animals. Stand up paddleboards, deep sea fishing, and kayaks await the more adventurous traveler. Year round festivals, dinner shows, amusement parks, and of course, the beach, means you’ll never run out of activities in North Myrtle Beach. The OD Pavilion Amusement Park has you covered for family fun, with old school amusements like a Ferris wheel, roller coasters, and bumper cars overlooking the ocean. Bring your putters because the mini golf here is truly epic. Test your swing at one of several world class courses. Rangeley is the place to immerse yourself in the north woods among lush, deep forests, gentle mountain peaks, endless lakes, and tons of wildlife. Grab your fishing pole and lure in a lunker- this area is known for awesome fishing. Paddle a canoe out and go birdwatching, or take a hike on one of the area’s many nature trails; but watch out for moose – they live here too.